Keep KU Gun-Free 2017. Also on Twitter, but not as often. 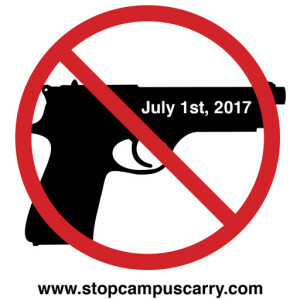 Stop Campus Carry (the site you are at now). Gun-Free UT (excellent site; incredible resources). Start with this myth-busting of arguments used by campus-carry supporters. Highly recommended. Pamela Colloff, “The Reckoning,” Texas Monthly, March 2016. “How does a bullet change a life?” Fifty years after the Texas Tower shooting, Colloff follows the life of Claire Wilson, who — at the age of 18 — was shot by Charles Whitman, at the University of Texas at Austin. Gun-Free UT, “The Arguments Used by Campus Carry Supporters Are Wrong.” Gun-Free UT, 15 Nov. 2015. “Mass shooters do not choose their targets because they are in Gun Free zones” and other myth-debunking points. Highly recommended. “Guns on Campus,” Everytown for Gun Safety, 9 July 2015. Fact sheets. Greg Hampikan, “When May I Shoot a Student?” New York Times, 27 Apr. 2014. “At present, the harshest penalty available here at Boise State is expulsion, used only for the most heinous crimes, like cheating on Scantron exams. But now that lethal force is an option, I need to know which infractions may be treated as de facto capital crimes.” Satire. Xavier Rotnofsky and Rohit Mandalapu, “How to Properly Implement Campus Carry,” Huffington Post, 15 Dec. 2015. “Some people are also angry by how much it’ll cost universities to enact campus carry, but those people aren’t seeing the many potential revenue streams on which universities can capitalize after implementation of the new policy. For example, universities can make Kevlar vests featuring the school’s colors and insignia to sell at orientation. Textbook companies can make textbooks heavier, with titanium-reinforced, bulletproof book covers.” Satire. Zack Beauchamp, “A huge international study of gun control finds strong evidence that it actually works,” Vox, 29 Feb. 2016. German Lopez, “A researcher explains the sad truth: we know how to stop gun violence. But we don’t do it,” Vox, 28 Mar. 2016. Kevin Quealy and Margot Sanger-Katz, “In other countries, you’re as likely to be killed by a falling object as a gun,” New York Times, 5 Dec. 2015. See also the resources in the “Activism” links above. Cornell University Law School’s Second Amendment page, including information on United States vs. Miller (1939) and District of Columbia vs. Heller (2008). Saul Cornell and Nathan DeNino, “Historical Perspectives. A Well-Regulated Right: The Early American Origins of Gun Control.” Fordham Law Review 73.2 (2004): 487-528. Note: This is a pdf. “Rather than stake out a strong claim against government, the original understanding of the right to bear arms gave government a strong claim on the lives and estates of its citizens” (496). SB 418 & HB 2118: “The Personal and Family Protection Act” (2006). Permits concealed carry. Note: This is a pdf. HB 2052: “An Act concerning firearms; dealing with the personal and family protection act” (2013). Concealed carry “shall not be prohibited in any state or municipal building unless such building has adequate security measures.” In other words, if a state building has adequate security (which is prohibitively expensive), then it can prohibit concealed carry. Otherwise, it cannot. Also: colleges and universities granted a four-year exemption. HB 2578: “The CLEO Shall Sign and Comprehensive Preemption” (2014). Prohibits local control of firearms. SB 45: “Authorizing the carrying of concealed handguns without a license under the personal and family protection act” (2015). Removes licensing requirement for concealed carry. SB 65, amendment: (2015). Hospitals not exempt from SB 418. Thus, concealed carry allowed in hospitals. Kansas Board of Regents’ “Frequently Asked Questions on Campus Carry in Kansas” (pdf, 20 April 2016). “No, an individual instructor cannot prohibit concealed carry in the instructor’s classroom, lab, or “private” office unless ASMs are provided on all public access entrances to the classroom, lab, office, or entire building in which these areas are located” (p. 4). ASM = “Adequate Security Measures,” which cost about $100,000 per building entrance. Also, “Universities should not ask housing applicants whether they intend to carry a concealed handgun on campus” (p. 9).